Graduation of March batch was held on 27th march 2014 at Pacific Hotel. About 30 surgeons and gynecologists were present to receive their certificate for F.MAS and D.MAS courses. There was a postive ambience in the party and everyone was in high spirits. Dr. Andee Dzulkarnaen Zakaria was named the topper among all the surgeons in the batch and Dr. Ruchi Bhaumik Thakor was the topper among all the gynecologists in the batch. They also received a merit certificate and a special trophy which is given to the toppers of every batch. The glorious event also included a brief speech by every surgeon and gynecologist on their experience at World Laparoscopy Hospital and they also gave a feedback about the course and training. Their hard work and determination helped them in achieving this goal and they ended the course with more enhanced laparoscopic skills than they started with. There was a positive ambiance in the party and everyone was in high spirits. 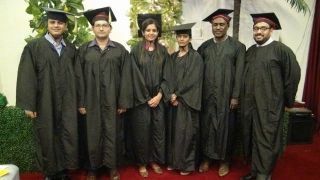 Dr. R.K. Mishra said during convocation "It makes little difference how many university courses or degrees you may own. If as a laparoscopic surgeon you cannot use your skill to move an idea from one doctor to another, your education is incomplete.